I’ve watched a couple of my friends participate in a unique monthly event called a Recipe Swap. Each month they are given a recipe to start from and their challenge is to ‘swap’ out some of the ingredients to make the end result their own personal and updated take on the original recipe. It sounded fun and creative and I loved seeing their results. That the recipes are from an old cookbook makes it even better; there is an element of simple charm that permeates this book that I really enjoy. I’ve chatted with Christianna Burwell, she the instigator of this group and a few weeks ago I begged we discussed my joining the group; it seemed so up my ‘I love to change up every recipe I do’ alley. The inspiration for the recipes that Christianna chooses come from an old cookbook that she found at the Tanque Verde Swap Meet. Titled All-Day Singin’ and Dinner on the Ground, it’s a hymnal and recipe book by Albert E. Brumley and the cookbook is still available for sale on the Brumley Music website. The recipes evoke a simpler time and the need for the constant care of a dish; no digital thermometers or Thermidor ovens involved, when paying close care is how you knew a dish was complete. Christianna was inspired to start this project that nods to these recipes from the past and allows us to put our personal spin on them reflective of our own tastes and schedules. This month the recipe that Christianna chose was for us was Wild Rabbit with Vegetables. 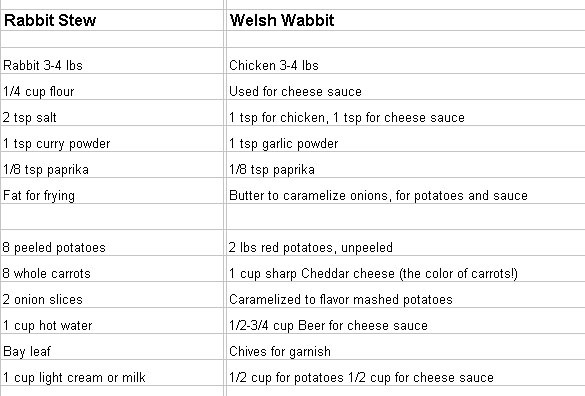 Thankful that the whole point of this exercise was to swap out some ingredients and make something new; my first order of business was to ‘Welsh’ on using rabbit and use chicken thighs instead. Westley might have had something to do with that (forgive the blurry photo but try taking a photo of a bunny that never sat still!). 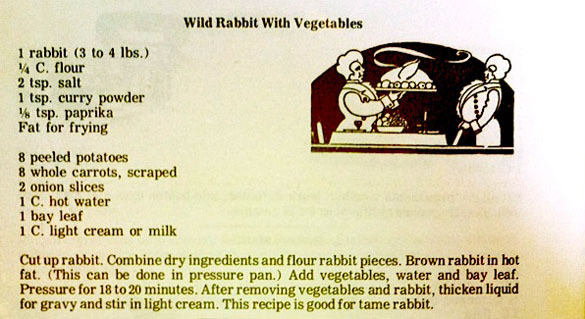 While the author of the recipe indicated it was good with tame rabbit, I seriously doubt they meant a rabbit named Westley who was my daughter’s pet, right? Who had a cage near the kitchen and roamed the kitchen and family room at will. Who anxiously waited for me early in the morning to sit and hand feed him his breakfast of carrots, spinach and other assorted vegetables. No, this was surely not the tame rabbit they meant and I could not bear the thought of eating rabbit any more than I could the thought of, well, let’s just say I have a dog I love too. Though Westley went to live with a new family after my daughter went back to finish and graduate from college, I can never forget how cute he was. I wish I could find the photo of him wearing his hand crocheted cap; this little lop eared bunny was just too adorable and he left an indelible impression on my heart and as a result his cousins are safe from my knife forever! Wikipedia indicates that rabbit meat can be used in most ways chicken meat is used so I did a role reversal and decided to use boneless chicken thighs in lieu of rabbit. In fact, well-known chef Mark Bittman has said that domesticated rabbit tastes like chicken because both are blank palettes upon which any desired flavors can be layered. I had yet to put together any sort of plan on what to prepare but what kept going through my mind was Welsh Rarebit, also called Welsh Rabbit even though there is nothing rare or rabbit about it. It is another very old recipe that consists of a cheese sauce poured over toast. And so it began…how could I make a dish with the proscribed ingredients, make a minimal number of substitutions while also including a Welsh Rarebit/Rabbit cheese sauce? OK, maybe I didn’t have to be this specific but until I put those two columns into an Excel spreadsheet I found it easy to lose track of what I wanted to ‘swap’ and it helped me gain clarity on that task. I challenged myself to change as few ingredients as possible and yet come up with something entirely unique. If you notice there is not much salt; I had 2 teaspoons total to use for the meat, mashed potatoes and cheese sauce. I ended up using it for the chicken and potatoes. I mean, potatoes with ANY salt? Couldn’t do it!! Keeping seasoning to a minimum in the potatoes called for me to get creative and why I chose to caramelize the onions in butter and add that to the potatoes…that enhanced their flavor dramatically and when combined with the other components of this dish, no extra seasoning was required. There is a lesson there…I would have never thought that 2 tsp of salt would be enough for this dish that can serve 8 people! Know what else made a huge difference? This amazing little thing I just got Friday. It’s a digital electric smoker from the folks at Masterbuilt and that’s another story in itself that I’ll share with you soon but I do know this…I should have had one of these a LONG time ago. Minimally seasoned chicken thighs came out tasting like pure Heaven. If you can’t smoke your meat and decide to make this recipe I’m sure it will be fine from the grill but I have to tell you…smoke it if you can. The combination of smoked chicken, cheddar cheese with beer and mashed potatoes was, as is popular to say…To. Die. For. I pondered what I had to use; what I could revise and still keep to a dish that represented the ‘spirit’ of the original and went to town. A layered dish of mashed potatoes flavored with caramelized onions, butter and milk; topped with smoked chicken seasoned simply with salt, garlic powder and paprika and finished with a Cheddar Cheese sauce flavored with Fat Tire Ale, a pale ale from the New Belgium Brewing Company. Was it a prophetic or pathetic reach that I felt this was the perfect brew since my time with Westley was as the result of my daughter going back to Colorado State University in Fort Collins, CO which is the home of New Belgium? No matter, might be both! My daughter is coming over in a bit to have leftovers. She is bringing a friend. I mentioned smoked chicken and cheddar beer sauce and all of a sudden I have company…ahh…isn’t that what Mom’s are for! 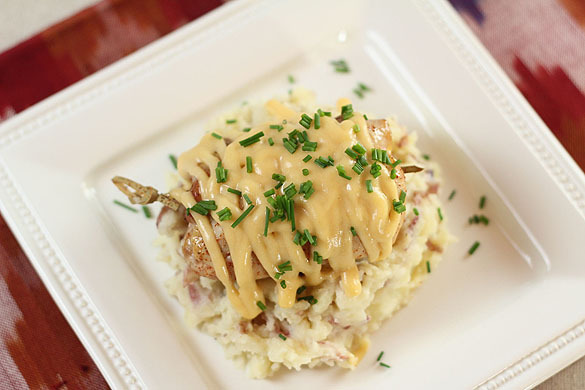 Smoked Chicken is served over smashed potatoes and finished with a beer/cheese sauce. 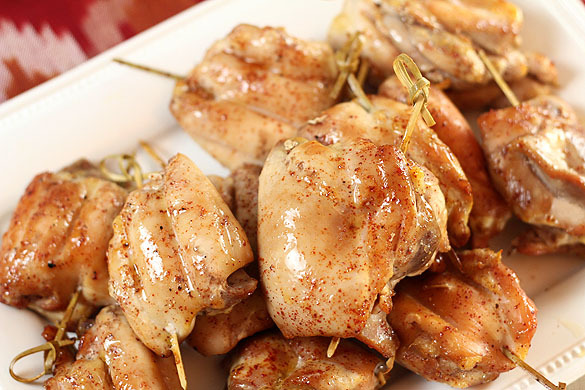 If using boneless chicken thighs, mold them into shape of whole thigh and skewer them to hold together.. Mix 1 tsp salt, 1 tsp garlic powder and 1/8 tsp paprika. Season both sides of chicken and either smoke or grill meat. I smoked them at 250 degrees for an hour and they were perfect. Melt 1 Tbsp of butter in small saucepan and saute chopped onions until just starting to turn brown. In the meantime, boil the potatoes until fork tender, about 15 minutes. Remove from heat, drain off water and return to pan. Do not peel! Mash potatoes coarsely and add caramelized onions, 1/2 cup of milk, 3 Tbsp of butter and 1/2 tsp of salt and mix thoroughly but gently until combined. Keep warm. In saucepan, melt remaining 2 Tbsp of butter. Add flour and cook until butter and flour mixture just starts to turn brown. Add 1/2 cup each of milk and beer to flour mixture and stir til thickened. Add cheese to mixture and stir over low heat until melted and smooth. To serve, put a large spoonful of mashed potatoes on plate, top with a chicken thigh and drizzle each thigh with some of the beer/cheese sauce. Garnish with chopped chives. Oh Chris…that is just the sweetest compliment since I so admire all that you do too. Thank you so much! Seems most people feel that way so feeling lucky I didn’t buck the trend…not sure how that would have gone down. The chicken was so good I have no regrets about using it at all. I never had a pet chicken! looks great! will have to try this! Do try it Alison…was one of those dishes i was so glad I made. We had a weekend of cool weather too it was one of those warm comfort food type dishes. Love all the challenges in the recipe swap group. Love the vintage recipes revitalized. Such fun. Now I just wish I would be organized enough to make one of these deadlines. Great twist Barb! Great recipe! It was fun Shulie…join in sometime when you can…it definitely stretches us a bit which is part of the fun. You savage you! No, really we had others do rabbit and in truth…I might have tried it if I could have found a resource. For rabbit though…could not call it bunny. THAT I could not do, ever. Looks like a fabulous meal. I’ll look forward to hearing more about the smoker. I think I could become something of a smoker fiend…curing bacon to smoke it next weekend and hoping to get ribs in tomorrow. I want to smoke some different things though…mac and cheese is first on the list. I adore this post! I wish I had a straw for your sauce!!! The sauce may have been made for this dish but it was so good…that beer business was the bomb, it will surely visit other things too. Brats are next I think! Ohhhh – cute as a bunny rabbit and yummy looking chicken. I bet he appreciated not being dinner, for sure! I’m pretty far removed from imagining that I could raise an animal and then use it for dinner. I suppose in some circles that is wrong or weak, but it’s just true. My ex’s family would raise a calf that they knew they would slaughter. I would have had to spirit them away to safety I’m sure! So glad you spared the bunny! Love how you adapted the original recipe, it looks delicious! Thank you Deb…it truly was. I’ve had it for dinner now three nights in a row and I looked forward to it each time! You win first prize. EXACTLY where his name came from. My daughter and I both adore that silly movie. But it tastes like chicken! ;-). Seriously very creative and love the idea of smoking it. I like this recipe, and I am greatly relieved you chose chicken! I had a good excuse but without that…rabbit is not something I could have found easily anyhow. I would have had to find a hunter! Those are some seriously mouth watering photographs and I can so relate to why you chose chicken. Even though I blame my husband for me not cooking rabbit this time, I am sure I would not have the heart to cut and cook a rabbit in my home. And after hearing about the photo of Westley wearing his hand crocheted cap (awwwwww)- the butchering would never happen on my watch! Delicious take on the swap! Thanks for understanding. If not Westley then I’m sure the bunnies in my backyard would have played a role. Not pets, but sure cute! Delicious looking Welsh Wabbit, Barbara! You know how I love cooking old recipes so this is right up my alley. Great changes/swaps you made for this. Bravo. I do know Lana…this would be so up your alley too! Let me know if you’re interested; it’s a very creative group but always looking for people who could really get into the challenge with us. Nice recipes, nice pictures and I love your new smoker! I love rabbit and we used to sell a lot of it 20-30 years ago, only sell a few a month these days (and more boneless and skinless chicken breasts than ever – I don’t get it!) Keep up the good work! Thanks Mick. Does Tony’s sell rabbit? I didn’t even know where to go if I had wanted to try rabbit! I did opt for boneless thighs and am so glad I did. I admit…I love dark meat and the convenience of having no bone in it was a big plus. Your post made me smile. Loved it. Then I have achieved nirvana…so glad you loved it. I love this concept of updated old recipes!! Your take on this dish is nothing short of inspired and the results I think speak for themselves!!! This is comfort food on steroids!! After seeing the pics of Westley I couldn’t have made the dish with rabbit either!! 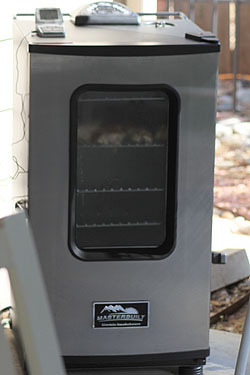 That smoker looks mighty impressive – can’t wait to see what else you “cook up” with it!! I kinda want to tilt my head back and spoon that cheese sauce in. It looks amazing. Funny, Fat Tire just came to MD 2 weeks ago finally. We even have the Chesapeake Commemorative bottle! Scrolling down while reading this lovely post actually gave my heart a start when I saw the picture of Westley! I was totally relieved to read further and see that you swapped out rabbit for chicken! 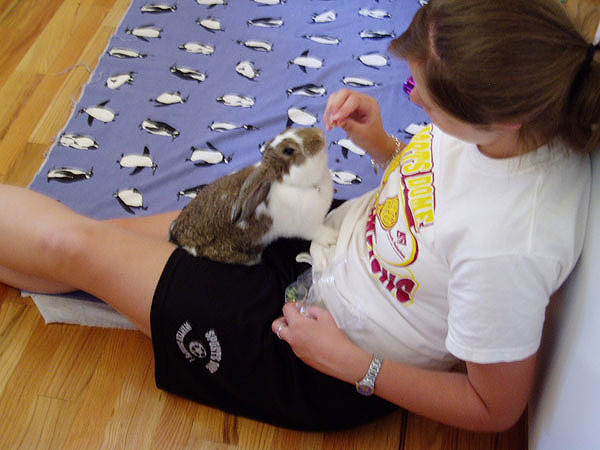 My daughter has had a pet rabbit for seven years (he believes he’s a cat). Your recipe looks great and I’m sure it tasted all the more wonderful shared with your daughter and her friend. P.S. My Mom used to make rabbit stew and tried to tell me that it was chicken…I always knew it wasn’t and wouldn’t eat it. So I just changed the title to include the word chicken! I just couldn’t do it and you see why. The girls loved it. Lauren’s friend is teaching herself how to cook; her mom never did it much when they were growing up I guess. I love feeding people but it’s most rewarding when they REALLY enjoy the effort. Girl that looks nummy! And with my head all floaty from allergy medicine Welsh Wabbit is making me giggle again 🙂 Great post! Thanks Red. Sorry about the head and the meds. My daughter suffers from allergies but I’ve been pretty lucky. Still, am very empathetic! I can’t blame you for choosing chicken thighs over rabbit, particularly with the memory of Westley’s big eyes staring at you. This dish looks like the ultimate in comfort. I’m sure you know this drill…you decide to try something, thinking it might work and then the end result is so beyond your expectations? That’s what happened here. Blame it on the smoked chicken…elevated the dish completely when joined with the cheddar sauce with beer. I was nervous to read this post. Rabbit or wabbit, I feel like I’m under the fire. This dish looks amazing and I’m glad to know it’s chicken after all. Whew! Shoot…I should have mentioned you too Ken…and I just might go edit. Cause I was a chicken too! I don’t blame you for a second for swapping out the rabbit. Little bunnies are too cute to eat! But the final dish is gorgeous. Great presentation! Seems to have been a recurring theme in our group event; something about bunnies right? And thank you…much appreciated comment. I think you did what you feel like you needed to do and I think it was the right decision. Even if I ate meat, I’m not sure I would be that quick to cook up a rabbit. You made a great dish here, though. Beautifully done. Thanks Brian. I’ll be doing some smoked macaroni and cheese soon…just for you! Holy cow…the cheese sauce with chives looks so good! 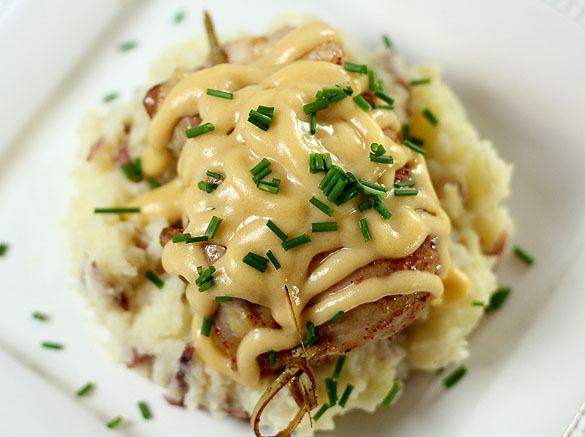 On top of mashed potatoes and chicken…yes, I will be making this soon! 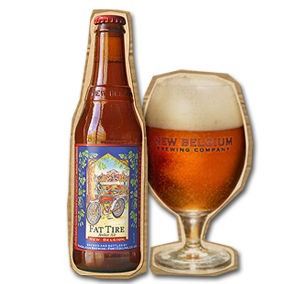 Love Fat Tire too…I used to live in Ft. Collins, so New Belgium is dear to me. Small world isn’t it? I found a recipe for a cheese sauce for Welsh Rarebit that had a much longer list of ingredients but to tell you the truth…this was so good I don’t think anything more was necessary. I mean…it had beer…that meant a lot! I’m sort of intrigued now about trying rabbit…but not quite there yet. Just can’t get the image out of my mind of that little guy eating out of my hand. Adorable bunny photos. Your recipe looks delicious and so relieved that you opted to use chicken thighs instead of rabbit. Love the smoker, you lucky girl. A friend of mine got one of these not long ago and uses the captured smoky drippings to make the best barbeque sauce I have ever eaten. Have fun with that! Love the cheese sauce and the smoked meat, what a classic mix. I wish there was enough room for a smoker on our little balcony, but I’m betting your recipe works great from the grill as well. Great swap! It does take up some room but until I got it I used a small smoker box from Williams Sonoma. The chips go in the bottom, the food on top, it’s covered and then the box goes on the grill. Was nice but I wanted to do too much to fit inside that 6X12″ box! Glad to see you used chicken instead of a sweet little fluffy bunny! I just didn’t have the heart to cook one either! I do love Welsh Rarebit and that was a very nice take on the dish, adding some nice elements to a classic! Great job on the swap! When I saw the photos of the bunny, then visually landed on the plate of ‘meat’ before finishing reading I was REALLY hoping they were completely unrelated! What a clever substitute Barb. Your recipe sounds delicious and undoubtedly all the more fun to make in your new ‘toy’! Sounds like it was a great meeting with Masterbuilt! I used to eat Welsh Rarebit all the time when I visited my Grandparents as a child. I think the sauce was even sold in frozen packets to easily warm up and serve over toast….can’t recall the last time I even thought of it. Where has that dish gone?! Hope you had a nice visit with your daughter and her friends. I’m sure by the looks of this dish, they’ll be back soon! If you had told me what you were serving, I would have flown to Colorado all the way from Serbia:) I don’t blame your daughter at all, as it looks amazing, and I am sure tastes even better. 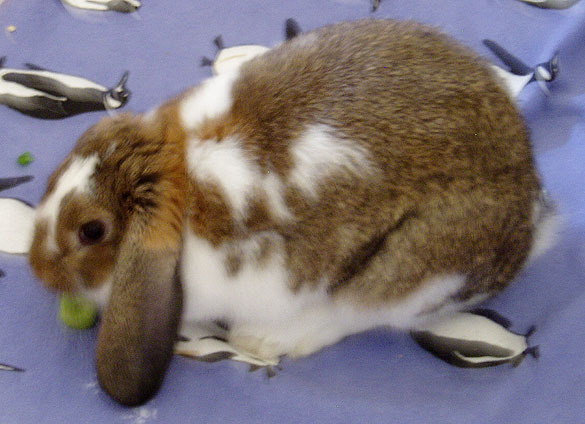 We had a rabbit as a pet while growing up, and it would be hard to think of cooking and eating a tame one. But, I try to forget how fluffy and cute they are from time to time, just to enjoy their taste. Well, if I had known that’s what it would take…what if I tell you I have leftovers? It was simply fantastic. Something that came about in this fun swap that I would have never put together otherwise! I’m glad I’m here too…with you and other friends. Cheers Lana! This looks so good! We have several old (American) cook books from the fifties that the Chef uses from time to time. There is a lot of comfort food within those covers and I think your version looks great. However, it is easy enough to get your hands on rabbit meat here especially now that Autumn is upon us so a bunny stew might be on the menu. Hope all is well. The photo of the bunny is great! Thank you Mona. I’m thinking I might have to do a rabbit challenge…it’s as uncomfortable for many as goat was so a great way to consider stretching ourselves. But for me? Not quite there yet. When I was at the Snowmass Culinary and Arts Festival a few weeks ago, one of the demonstrations showed us how we could create a way to smoke foods in the kitchen. The only thing was, it was outdoors and all I can say is…good thing. Smoke is not for inside! I do have a very small smoker unit that allowed me to smoke on my grill but the results just were not the same, not even close. Wish I could send you some Rosa! Welsh Wabbit!!! I love it. Barb, thanks so much for being a part of the swap, it’s so fun, and I hope it encourages each of us to take our writing and food-loving to a deeper level. You clearly have, and I enjoyed reading this post. Thank you Christianna; for the sweet compliment but also for letting me participate. I loved the exercise and just as lovely…was crazy about the end result!